Quote: Otonashi awakens only to learn he is dead. A rifle-toting girl named Yuri explains that they are in the afterlife, and Otonashi realizes the only thing he can remember about himself is his name. Yuri tells him that she leads the Shinda Sekai Sensen (Afterlife Battlefront) and wages war against a girl named Tenshi. Unable to believe Yuri's claims that Tenshi is evil, Otonashi attempts to speak with her, but the encounter doesn't go as he intended. As another works from Jun Maeda and part of KEY VN adaptation (related: Clannad, Air, Kanon, Little Busters!, and recently Charlotte) I rate this one as another good work yet a boring one. Why? 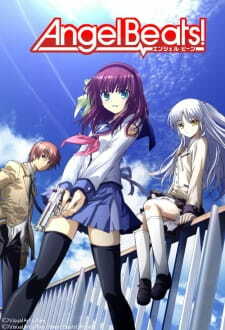 Angel Beats story line took an idea of purgatory(afterlife) with the high school setting. High school setting is one of the best part which Maeda specialize at. While the plot actually works fairly well within that setting, there isn't actually anything that I found inspiring or moving in any way. In addition to this the whole basis of the story is that this particular purgatory is only for young people, however one has to question why this is so, and also why the only young people who get to go there are all people with regrets. Throghout the story, you will discover a little bit of the characters previous live but you will see that this anime is not tear jerking as another work which previously made. Purgatory is the last chance a soul has to "get it right", and whilst Angel Beats does kind of show this, the lack of anyone who died for revenge makes the whole story unbalanced. The fact that almost everyone in the story only has regret makes the whole show a bit too sugary sweet, and while the whole series is actually pretty well written, this only makes the areas that are missing more pronounced. The short duration of the series was at fault when the characters couldn't even get a proper development and backstory and mostly because of that, the story, on the whole, fell short. The huge amount of comic relief (at times, unneeded) didn't help much either. Honestly, they could surely have sacrificed some of the rather drawn-out comical scenes for some backstory right? Well, they obviously thought showing like only 6 backstory (out of 18+ SSS characters) is enough, otherwise they could have shown at least one or two more in just 13 episodes. Also for the ending... well it's loved by a lot of people and disliked by others. As for me, I was very disappointed by it. The romance buildup towards the ending only had a few episodes to go for, and was rushed and just crammed together in the last few episodes, having almost no development whatsoever. I feel like some of the characters in this show have a good amount of fanboys and girls. I feel this because their designs, along with the superb animation make these characters have a very good look, although their personalities all were clearly lacking. I personally found most of the characters FAR too one dimensional. This is especially true with the very large ensemble of side characters that never seem to get any proper attention or development. With an uninteresting lead, and one dimensional characters, it usually spells trouble. However, the fantastic character arcs for four of the characters were so good that I really can't say the characters were anything worse than above average. These arcs were truly fantastic. However, because the majority of the cast was one dimensional, predictable, and lacked development, the overall score for the characters cannot really be too high. TL;dr: The character development is unsatisfactory. With a few development and the ending which feel too rushed. The Art is a standout. It was just stunning, beautiful and eye-catching. The character and background designs were, overall, great. The animation was also great. It was crisp and fluid, and everything from character movements to the little bits of battle scenes we had were animated very well. But more accurately you'll be able to notice the contrasts between darks and lights in every scene making it seem that the lights are bleeding into the darks making it brighter than it appears. Looking at one scene long enough may get heavy on the eyes, but it sure is pretty. Angel Beats! is very colorful, backgrounds are attractively detailed, and animation is smooth for the most part. Sound aspect, which I easily thought was the 2 of the best parts of the show, the other being the Art. The OP/ED were great but the soundtracks were really memorable to me. They fit the scenes very well, especially the beautiful and sad soundtracks. To me, without the soundtracks, some scenes wouldn't have felt the same way as it did. I personally enjoyed Angel Beats! despite its flaws. Although most of the enjoyment score comes from the first couple of episodes, the last couple still weren't downright terrible, it was just too rushed to the point it became uninteresting. In my opinion, the comedy was decent but it was just too drawn-out. For the sad scenes, I personally found only one scene to be sad, I didn't cry, but it was still, sad. Overall, Angel Beats! is a good anime with some outstanding aspects to it, accompanied by departments where it could have been executed a LOT better. A longer duration could have helped a lot for Angel Beats! as it could have had more developed story and characters, but what's done is done. I'd say Angel Beats! is on the overrated side, but being overrated doesn't mean that you shouldn't watch it. Who knows? For you Angel Beats could be a fun, sad, and enjoyable experience as a whole. Quote: Angel Beats story line took an idea of purgatory(afterlife) with the high school setting. High school setting is one of the best part which Maeda specialize at. While the plot actually works fairly well within that setting, there isn't actually anything that I found inspiring or moving in any way. In addition to this the whole basis of the story is that this particular purgatory is only for young people, however one has to question why this is so, and also why the only young people who get to go there are all people with regrets. Base from watching the anime, Otanashi is a university student before he died and went to "purgatory". Maybe some of the characters are the same with him. So i think the "purgatory" is not only for young people. But nice review. I also think that the story/plot of Angel Beats is lacking at some point (what's with the boy called The AI). I agree that when you watched the ending or last arc you might think that they rushed it. Maybe, but idk.. Chaa the leader from the guild despite look older were said as the same age with Otonashi and the others. But yeah, it's too bad that they rush it. One of my favorite anime though. In a realm within the afterlife, a band of teens fight to keep from being taken to the next level.